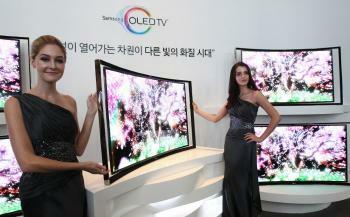 Amazon now lists Samsung's KN55S9C Full-HD 55" curved OLED TV. The S9C ships now for $8,997 from Video & Audio Center. Amazon's page says there's only one TV left in stock, hopefully more will arrive soon. Samsung KN55S9C offers the "perfect picture quality" (according to Samsung) as the distance from the viewer to the TV screen is the same from almost any angle. It supports Multi-view (where two users can watch two different 2D programs using active-shutter 3D glasses) and it's also compatible with the company's Evolution Kit, ensuring that the TV is future-proofed. 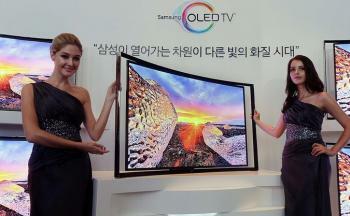 The OLED TV weighs 27Kg and is 5.3 inches deep. You cannot mount it on a wall due to the curve. CNET's David Katzmaier posted a very positive review on Samsung's OLED TV, saying that the TV offers the best picture he ever saw, surpassing even the best plasma and LED LCDs.